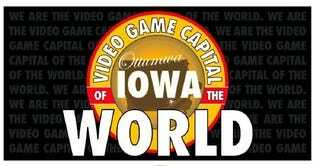 Less than a year after it was first conceived, the International Video Game Hall of Fame and Museum at Ottumwa, Iowa has announced its first class of enshrinees, who will be inducted during a four-day gala event in August. At this time last year, the idea for a Hall of Fame had barely taken root among local gaming enthusiasts, seeking to connect the city's history as an arcade gaming mecca in the early days of video games to the present. Municipal and business leaders, reminded of the town's connection in large part by this Kotaku feature story in April 2009, quickly pursued the concept as a tourism and business development opportunity for the city, with state support, and announced the Hall's launch last year. A full list of enshrinees was not immediately known at the time of writing, but an announcement in the Ottumwa Courier indicated that Atari founder and Pong creator Nolan Bushnell will be enshrined, along with Billy Mitchell, owner of the world record in Donkey Kong, and professional gamer Johnathan "Fatal1ty" Wendell. They will be honored during "The Big Bang 2010: Ottumwa's Video Game Festival" from Aug. 5 to Aug. 8 in Ottumwa. The festival will feature contests, concerts, dealer showrooms, panel discussions, guest celebrities, costume contests, historic museum displays and movies. Ottumwa, Iowa is the ancestral home of Twin Galaxies, the international high score sanctioning authority that began as an arcade in the city's downtown. Though it rose to prominence during the early days of arcade gaming, attracting nationwide attention, the arcade itself faded from view in the years since as video games moved out of arcades and pizza parlors and onto PCs and consoles. Twin Galaxies, now based 25 miles away in Fairfield, Iowa, would go on to prominence certifying and refereeing high scores and other record attempts, but the arcade that started it all closed long ago. For information on attending, visit the link below.